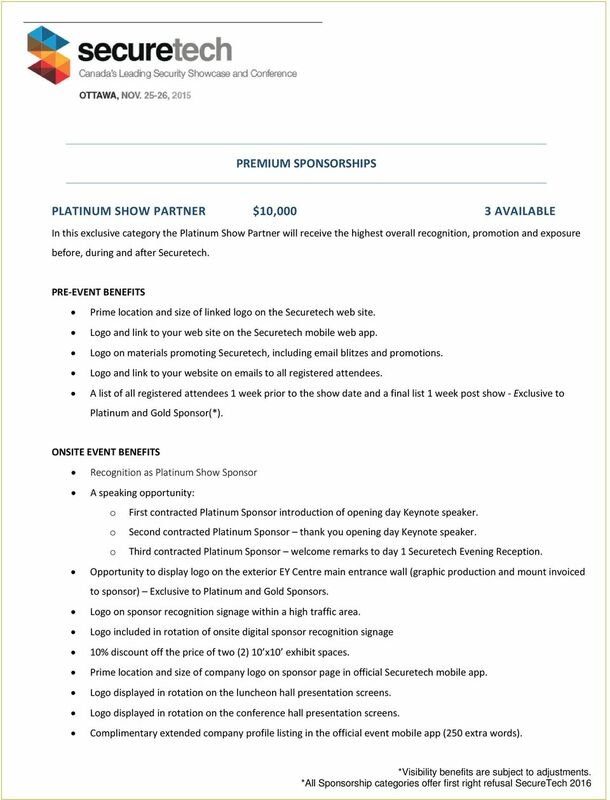 Download "PREMIUM SPONSORSHIPS PLATINUM SHOW PARTNER $10,000 3 AVAILABLE"
1 PREMIUM SPONSORSHIPS PLATINUM SHOW PARTNER $10,000 3 AVAILABLE In this exclusive category the Platinum Show Partner will receive the highest overall recognition, promotion and exposure before, during and after Securetech. Prime location and size of linked logo on the Securetech web site. Logo and link to your web site on the Securetech mobile web app. Logo on materials promoting Securetech, including blitzes and promotions. Logo and link to your website on s to all registered attendees. A list of all registered attendees 1 week prior to the show date and a final list 1 week post show - Exclusive to Platinum and Gold Sponsor(*). 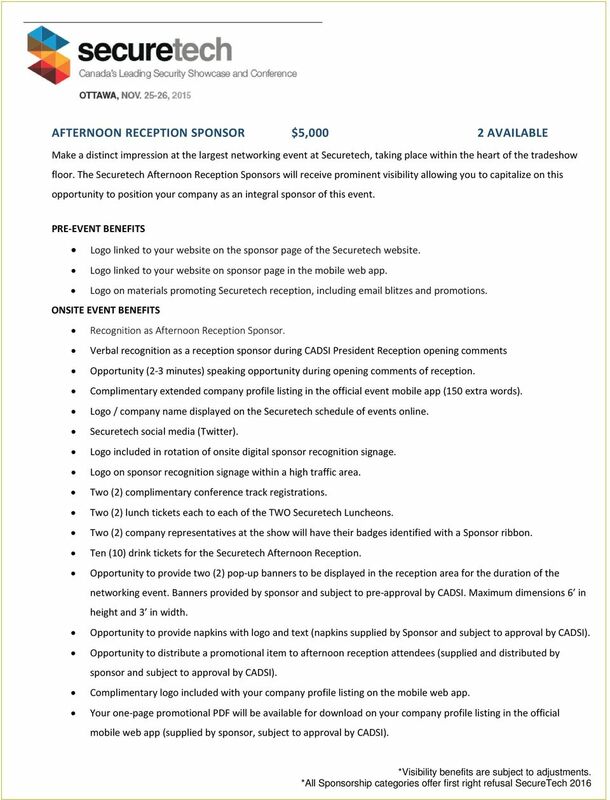 Recognition as Platinum Show Sponsor A speaking opportunity: o First contracted Platinum Sponsor introduction of opening day Keynote speaker. o Second contracted Platinum Sponsor thank you opening day Keynote speaker. o Third contracted Platinum Sponsor welcome remarks to day 1 Securetech Evening Reception. Opportunity to display logo on the exterior EY Centre main entrance wall (graphic production and mount invoiced to sponsor) Exclusive to Platinum and Gold Sponsors. 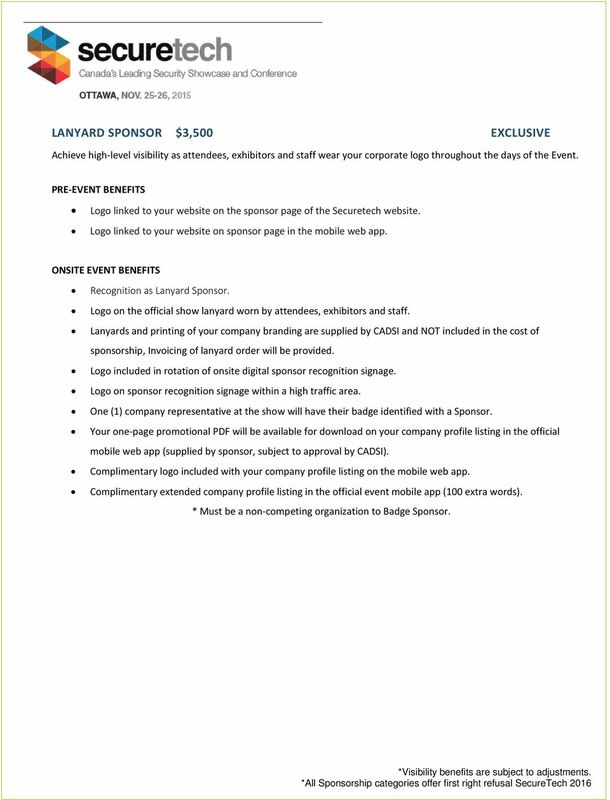 Logo included in rotation of onsite digital sponsor recognition signage 10% discount off the price of two (2) 10 x10 exhibit spaces. Prime location and size of company logo on sponsor page in official Securetech mobile app. Logo displayed in rotation on the luncheon hall presentation screens. Logo displayed in rotation on the conference hall presentation screens. Complimentary extended company profile listing in the official event mobile app (250 extra words). 2 Securetech social media to highlight Sponsorship. Four (4) complimentary conference track registrations. Exclusive table reserved in a prime location in the main conference hall (upon confirmation of attendance). Exclusive table reserved in prime location at each of the two Securetech luncheons. Table identified with tent card and company logo. Exclusive table reserved in a prime location in the Business Development (B2B/G) area with confirmation of requirement. Ten (10) lunch tickets for each Securetech luncheon. Ten (10) company representatives at the show may have their badges identified with a SPONSOR ribbon. Ten (10) drink tickets for the Securetech Afternoon Reception. Opportunity to provide four (4) pop-up banners to be displayed in high traffic area. Banners provided by sponsor and subject to pre-approval by CADSI. Maximum dimensions 6 in height and 3 in width. Verbal recognition as a Platinum Partnerships during select show announcements. Opportunity to distribute a promotional item to attendees at registration. (Supplied by sponsor and subject to approval by CADSI). A list of all registered attendees* 1 week prior to the show date and a final list 1 week post show. (Exclusive to Platinum Sponsors) *collection of list of names is subject to Canadian anti-spam laws. 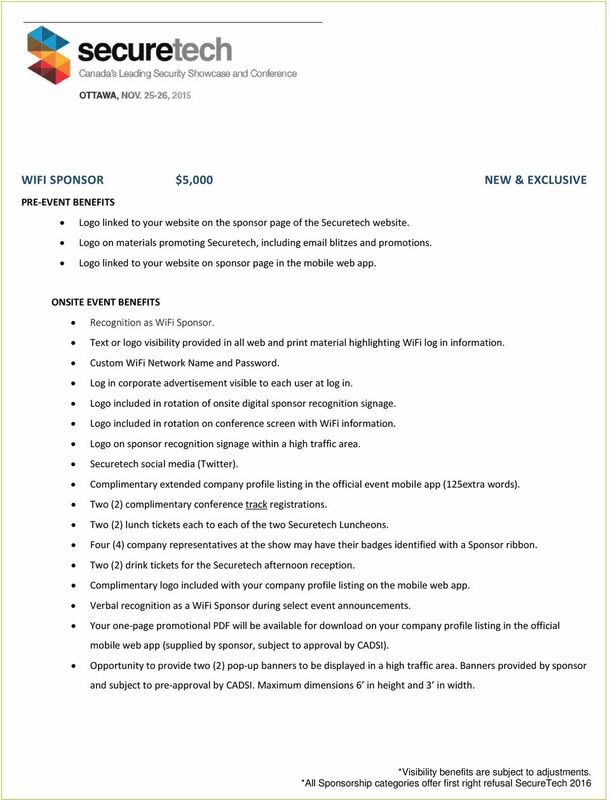 3 GOLD SPONSOR $7,500 4 AVAILABLE Logo on materials promoting Securetech, including blitzes and promotions. A list of all registered conference attendees* 1 week prior to the event. Recognition as Gold Sponsor Opportunity to display logo on the exterior EY Centre main entrance wall (graphic production and mount invoiced to sponsor) Exclusive to Presenting and Gold Sponsors. 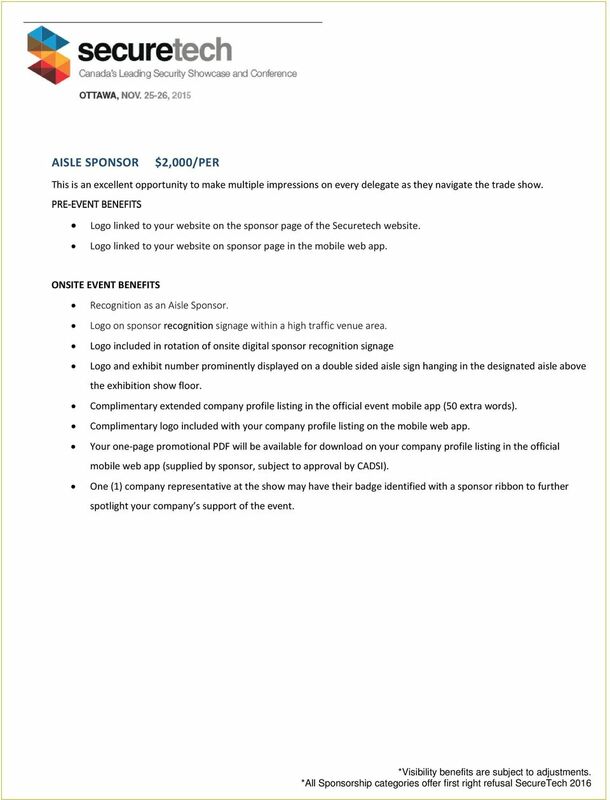 Logo included in rotation of onsite digital sponsor recognition signage Complimentary extended company profile listing in the official event mobile app (200 extra words). Two complimentary conference track registrations. Conference table reserved in a prime location in the main conference hall (with confirmation of attendance). Six (6) luncheon tickets each to each of the two Securetech Luncheons. Luncheon table reserved in a prime location for both lunches. Each table with tent card and company logo. Six (6) company representatives at the show may have their badges identified with a Sponsor ribbon. Six (6) drink tickets for the Securetech Afternoon Reception. Opportunity to provide two (2) pop-up banners to be displayed in a high traffic areas. Banners provided by sponsor and subject to pre-approval by CADSI. Maximum dimensions 6 in height and 3 in width. Verbal recognition as a Gold sponsor during select event announcements. A final list of all registered event attendees* 1 week post show. *collection of list of names is subject to Canadian anti-spam laws. 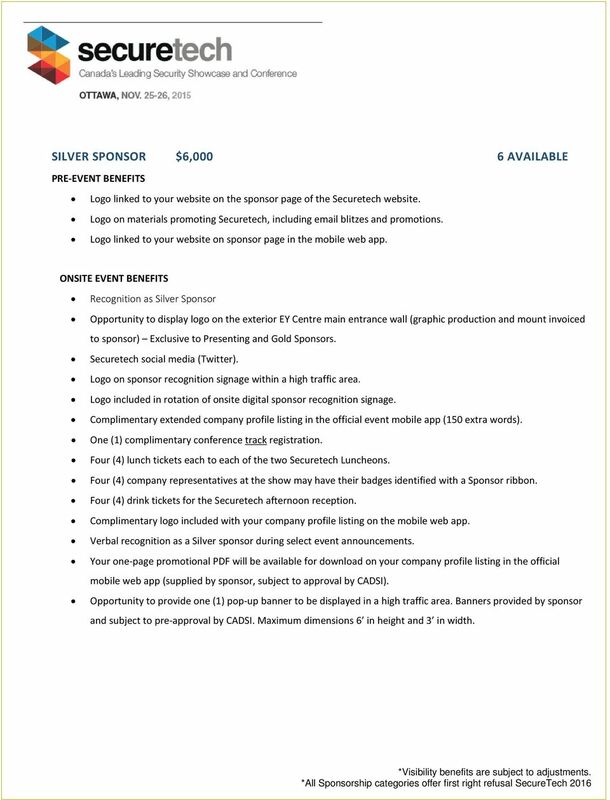 4 SILVER SPONSOR $6,000 6 AVAILABLE Logo on materials promoting Securetech, including blitzes and promotions. Recognition as Silver Sponsor Opportunity to display logo on the exterior EY Centre main entrance wall (graphic production and mount invoiced to sponsor) Exclusive to Presenting and Gold Sponsors. Complimentary extended company profile listing in the official event mobile app (150 extra words). One (1) complimentary conference track registration. Four (4) lunch tickets each to each of the two Securetech Luncheons. Four (4) company representatives at the show may have their badges identified with a Sponsor ribbon. Four (4) drink tickets for the Securetech afternoon reception. Verbal recognition as a Silver sponsor during select event announcements. Opportunity to provide one (1) pop-up banner to be displayed in a high traffic area. Banners provided by sponsor and subject to pre-approval by CADSI. Maximum dimensions 6 in height and 3 in width. 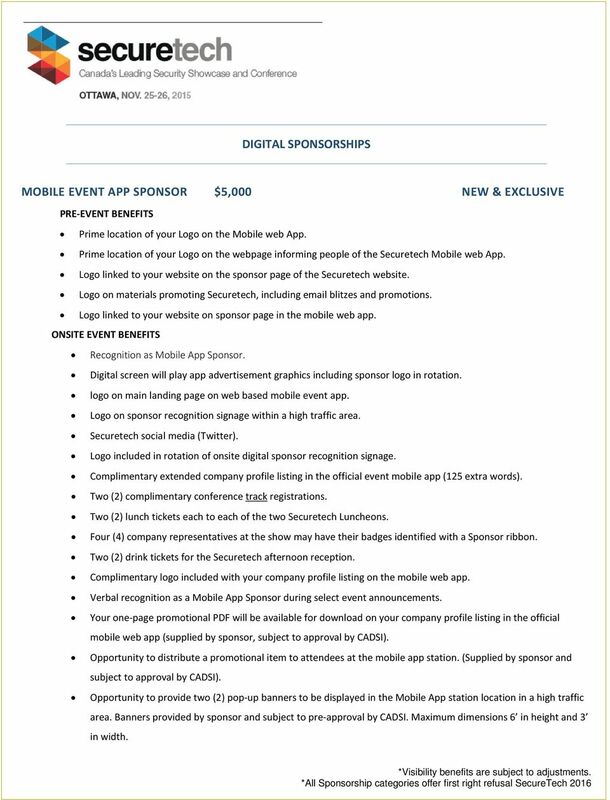 5 DIGITAL SPONSORSHIPS MOBILE EVENT APP SPONSOR $5,000 NEW & EXCLUSIVE Prime location of your Logo on the Mobile web App. Prime location of your Logo on the webpage informing people of the Securetech Mobile web App. Logo on materials promoting Securetech, including blitzes and promotions. Recognition as Mobile App Sponsor. Digital screen will play app advertisement graphics including sponsor logo in rotation. logo on main landing page on web based mobile event app. Complimentary extended company profile listing in the official event mobile app (125 extra words). Two (2) complimentary conference track registrations. Two (2) lunch tickets each to each of the two Securetech Luncheons. Four (4) company representatives at the show may have their badges identified with a Sponsor ribbon. Two (2) drink tickets for the Securetech afternoon reception. 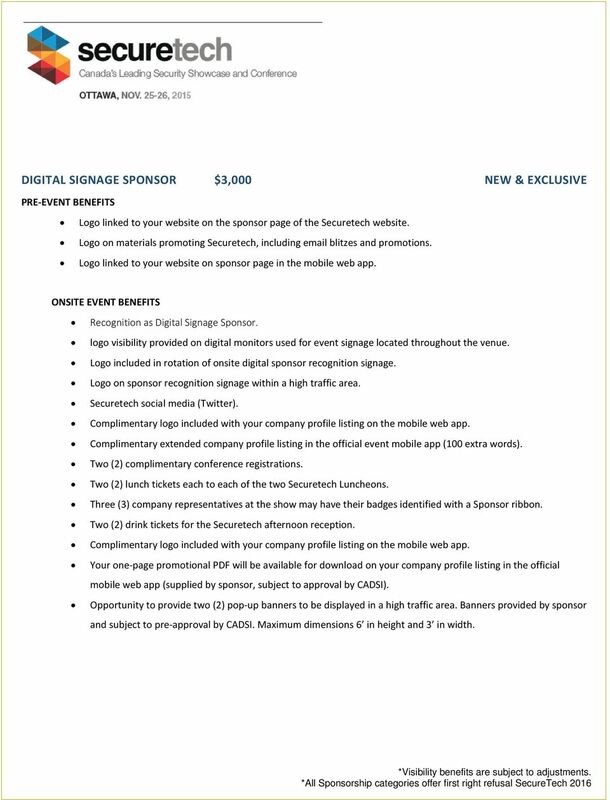 Verbal recognition as a Mobile App Sponsor during select event announcements. Opportunity to distribute a promotional item to attendees at the mobile app station. (Supplied by sponsor and subject to approval by CADSI). Opportunity to provide two (2) pop-up banners to be displayed in the Mobile App station location in a high traffic area. Banners provided by sponsor and subject to pre-approval by CADSI. Maximum dimensions 6 in height and 3 in width. 6 WIFI SPONSOR $5,000 NEW & EXCLUSIVE Logo on materials promoting Securetech, including blitzes and promotions. Recognition as WiFi Sponsor. Text or logo visibility provided in all web and print material highlighting WiFi log in information. Custom WiFi Network Name and Password. Log in corporate advertisement visible to each user at log in. Logo included in rotation on conference screen with WiFi information. Complimentary extended company profile listing in the official event mobile app (125extra words). Two (2) complimentary conference track registrations. Two (2) lunch tickets each to each of the two Securetech Luncheons. Four (4) company representatives at the show may have their badges identified with a Sponsor ribbon. Two (2) drink tickets for the Securetech afternoon reception. Verbal recognition as a WiFi Sponsor during select event announcements. Opportunity to provide two (2) pop-up banners to be displayed in a high traffic area. Banners provided by sponsor and subject to pre-approval by CADSI. Maximum dimensions 6 in height and 3 in width. 7 DIGITAL SIGNAGE SPONSOR $3,000 NEW & EXCLUSIVE Logo on materials promoting Securetech, including blitzes and promotions. Recognition as Digital Signage Sponsor. logo visibility provided on digital monitors used for event signage located throughout the venue. Complimentary extended company profile listing in the official event mobile app (100 extra words). Two (2) complimentary conference registrations. Two (2) lunch tickets each to each of the two Securetech Luncheons. Three (3) company representatives at the show may have their badges identified with a Sponsor ribbon. Two (2) drink tickets for the Securetech afternoon reception. Opportunity to provide two (2) pop-up banners to be displayed in a high traffic area. Banners provided by sponsor and subject to pre-approval by CADSI. Maximum dimensions 6 in height and 3 in width. 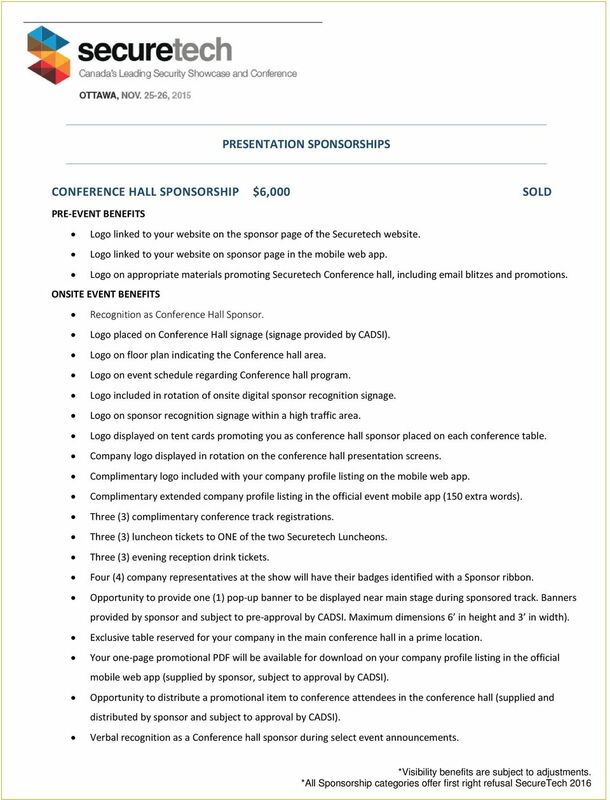 8 PRESENTATION SPONSORSHIPS CONFERENCE HALL SPONSORSHIP $6,000 SOLD Logo on appropriate materials promoting Securetech Conference hall, including blitzes and promotions. Recognition as Conference Hall Sponsor. Logo placed on Conference Hall signage (signage provided by CADSI). Logo on floor plan indicating the Conference hall area. Logo on event schedule regarding Conference hall program. Logo displayed on tent cards promoting you as conference hall sponsor placed on each conference table. Company logo displayed in rotation on the conference hall presentation screens. Complimentary extended company profile listing in the official event mobile app (150 extra words). Three (3) complimentary conference track registrations. Three (3) luncheon tickets to ONE of the two Securetech Luncheons. Three (3) evening reception drink tickets. Four (4) company representatives at the show will have their badges identified with a Sponsor ribbon. Opportunity to provide one (1) pop-up banner to be displayed near main stage during sponsored track. Banners provided by sponsor and subject to pre-approval by CADSI. Maximum dimensions 6 in height and 3 in width). Exclusive table reserved for your company in the main conference hall in a prime location. Opportunity to distribute a promotional item to conference attendees in the conference hall (supplied and distributed by sponsor and subject to approval by CADSI). Verbal recognition as a Conference hall sponsor during select event announcements. 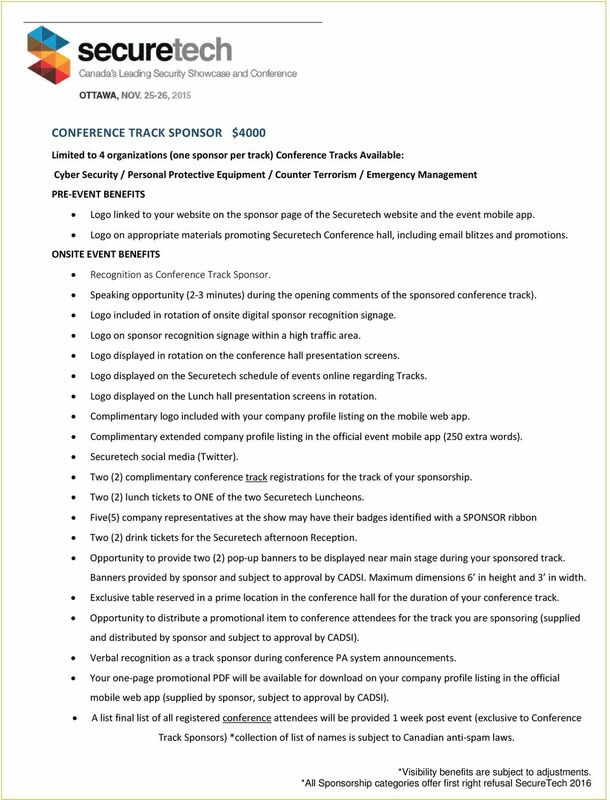 9 CONFERENCE TRACK SPONSOR $4000 Limited to 4 organizations (one sponsor per track) Conference Tracks Available: Cyber Security / Personal Protective Equipment / Counter Terrorism / Emergency Management Logo linked to your website on the sponsor page of the Securetech website and the event mobile app. Logo on appropriate materials promoting Securetech Conference hall, including blitzes and promotions. Recognition as Conference Track Sponsor. Speaking opportunity (2-3 minutes) during the opening comments of the sponsored conference track). Logo displayed in rotation on the conference hall presentation screens. Logo displayed on the Securetech schedule of events online regarding Tracks. Logo displayed on the Lunch hall presentation screens in rotation. Complimentary extended company profile listing in the official event mobile app (250 extra words). 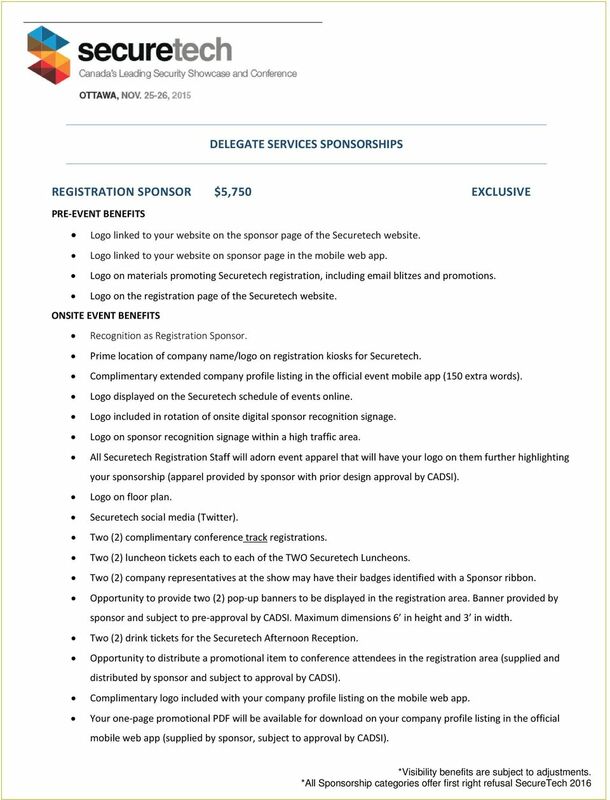 Two (2) complimentary conference track registrations for the track of your sponsorship. Two (2) lunch tickets to ONE of the two Securetech Luncheons. Five(5) company representatives at the show may have their badges identified with a SPONSOR ribbon Two (2) drink tickets for the Securetech afternoon Reception. Opportunity to provide two (2) pop-up banners to be displayed near main stage during your sponsored track. Banners provided by sponsor and subject to approval by CADSI. Maximum dimensions 6 in height and 3 in width. Exclusive table reserved in a prime location in the conference hall for the duration of your conference track. Opportunity to distribute a promotional item to conference attendees for the track you are sponsoring (supplied and distributed by sponsor and subject to approval by CADSI). Verbal recognition as a track sponsor during conference PA system announcements. A list final list of all registered conference attendees will be provided 1 week post event (exclusive to Conference Track Sponsors) *collection of list of names is subject to Canadian anti-spam laws. 10 INNOVATION STAGE SPONSOR $5000 EXCLUSIVE Logo on materials promoting Securetech, including blitzes and promotions. Recognition as Innovation Stage Sponsor. Speaking opportunity (2-3 minutes) during the opening comments of the innovation stage. 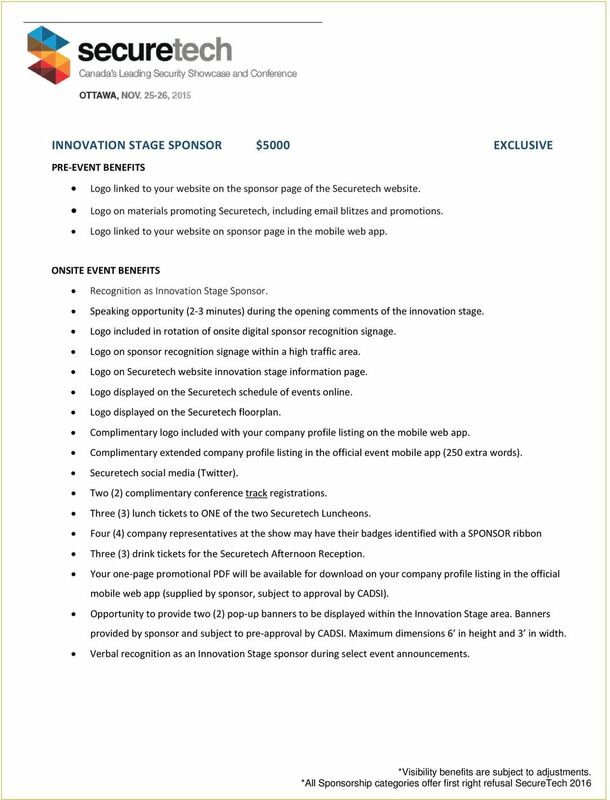 Logo on Securetech website innovation stage information page. Logo displayed on the Securetech schedule of events online. Logo displayed on the Securetech floorplan. Complimentary extended company profile listing in the official event mobile app (250 extra words). Two (2) complimentary conference track registrations. Three (3) lunch tickets to ONE of the two Securetech Luncheons. Four (4) company representatives at the show may have their badges identified with a SPONSOR ribbon Three (3) drink tickets for the Securetech Afternoon Reception. Opportunity to provide two (2) pop-up banners to be displayed within the Innovation Stage area. Banners provided by sponsor and subject to pre-approval by CADSI. Maximum dimensions 6 in height and 3 in width. Verbal recognition as an Innovation Stage sponsor during select event announcements. 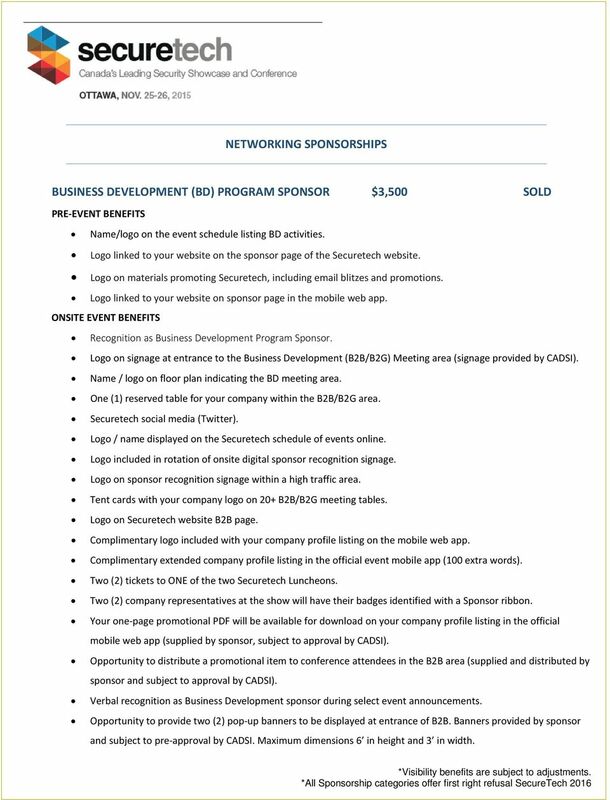 11 NETWORKING SPONSORSHIPS BUSINESS DEVELOPMENT (BD) PROGRAM SPONSOR $3,500 SOLD Name/logo on the event schedule listing BD activities. Logo on materials promoting Securetech, including blitzes and promotions. Recognition as Business Development Program Sponsor. Logo on signage at entrance to the Business Development (B2B/B2G) Meeting area (signage provided by CADSI). Name / logo on floor plan indicating the BD meeting area. One (1) reserved table for your company within the B2B/B2G area. Logo / name displayed on the Securetech schedule of events online. Tent cards with your company logo on 20+ B2B/B2G meeting tables. Logo on Securetech website B2B page. Complimentary extended company profile listing in the official event mobile app (100 extra words). Two (2) tickets to ONE of the two Securetech Luncheons. Two (2) company representatives at the show will have their badges identified with a Sponsor ribbon. Opportunity to distribute a promotional item to conference attendees in the B2B area (supplied and distributed by sponsor and subject to approval by CADSI). Verbal recognition as Business Development sponsor during select event announcements. Opportunity to provide two (2) pop-up banners to be displayed at entrance of B2B. Banners provided by sponsor and subject to pre-approval by CADSI. Maximum dimensions 6 in height and 3 in width. 12 NETWORKING LOUNGE SPONSOR $3,500 EXCLUSIVE Logo on materials promoting Securetech, including blitzes and promotions. Recognition as Networking Lounge Sponsor. Logo placed on show signage near the entrance to the networking lounge area (signage provided by CADSI). Logo on floor plan. Logo on the event schedule listing Networking lounge activities. Logo or 30 second video played in rotation on digital signage located within the networking lounge. Tent cards with your logo on tables throughout the networking lounge. Complimentary extended company profile listing in the official event mobile app (100 extra words). Two (2) lunch tickets to ONE of the two Securetech Luncheons. Two (2) company representatives at the show will have their badges identified with a Sponsor ribbon. Opportunity to provide up to Three (3) pop-up banners for the networking lounge area. Banners provided by sponsor and subject to pre-approval by CADSI. Maximum dimensions 6 in height and 3 in width). Opportunity to distribute a promotional item to delegates within the networking lounge (supplied and distributed by sponsor and subject to approval by CADSI). 13 LUNCHEON SPONSOR $3,750 TWO (2) ORGANIZATION PER LUNCHEON Logo on materials promoting Securetech Luncheon, including blitzes and promotions. Recognition as Luncheon Sponsor. Opportunity to introduce or thank the keynote speaker, order of presenting determined by CADSI. Verbal recognition by CADSI President at the opening remarks of conference. Verbal recognition on-site regarding luncheon announcements. Logo displayed on the Securetech schedule of events online. Logo displayed on the Lunch hall presentation screens in rotation. Up to two (2) company representatives at the show will have their badges identified with a Sponsor ribbon. Logo on tent cards placed on all tables at the luncheon identifying you as the sponsoring company. Complimentary extended company profile listing in the official event mobile app (100 extra words). 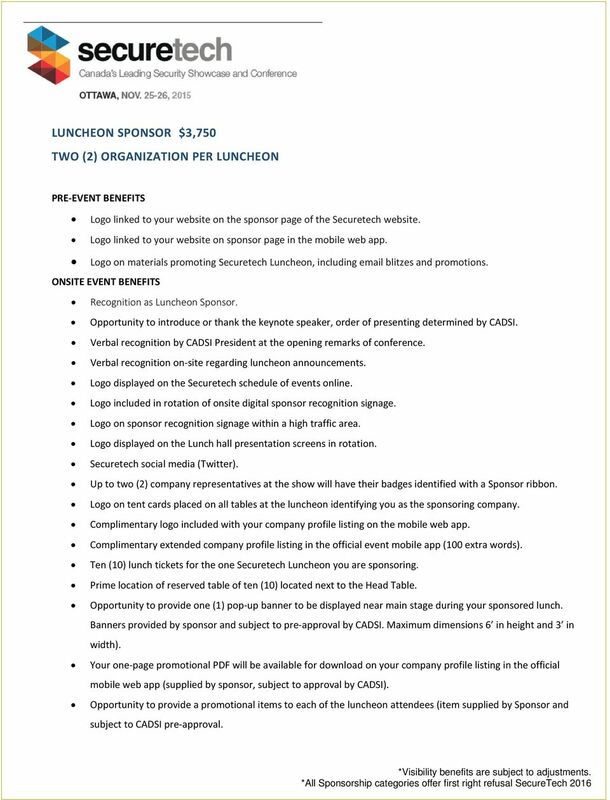 Ten (10) lunch tickets for the one Securetech Luncheon you are sponsoring. Prime location of reserved table of ten (10) located next to the Head Table. Opportunity to provide one (1) pop-up banner to be displayed near main stage during your sponsored lunch. Banners provided by sponsor and subject to pre-approval by CADSI. Maximum dimensions 6 in height and 3 in width). Opportunity to provide a promotional items to each of the luncheon attendees (item supplied by Sponsor and subject to CADSI pre-approval. 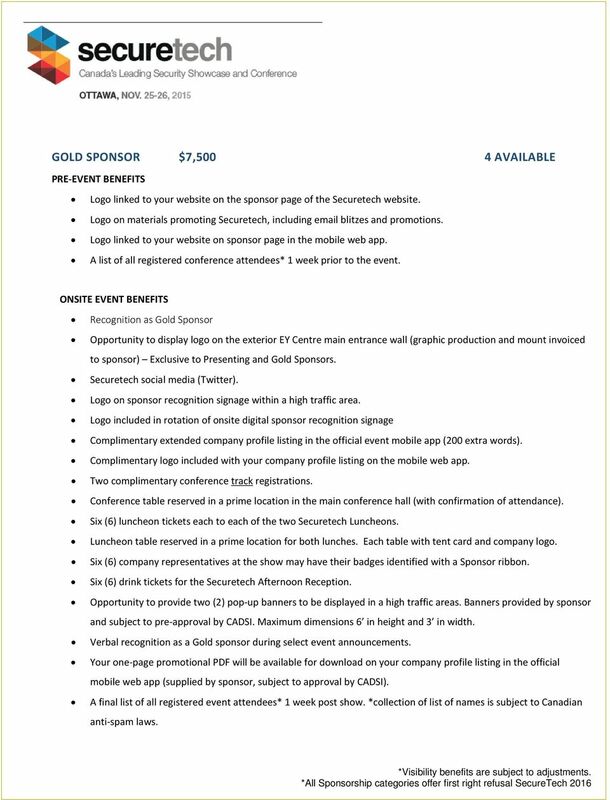 14 AFTERNOON RECEPTION SPONSOR $5,000 2 AVAILABLE Make a distinct impression at the largest networking event at Securetech, taking place within the heart of the tradeshow floor. The Securetech Afternoon Reception Sponsors will receive prominent visibility allowing you to capitalize on this opportunity to position your company as an integral sponsor of this event. Logo on materials promoting Securetech reception, including blitzes and promotions. Recognition as Afternoon Reception Sponsor. Verbal recognition as a reception sponsor during CADSI President Reception opening comments Opportunity (2-3 minutes) speaking opportunity during opening comments of reception. Complimentary extended company profile listing in the official event mobile app (150 extra words). Logo / company name displayed on the Securetech schedule of events online. Two (2) complimentary conference track registrations. Two (2) lunch tickets each to each of the TWO Securetech Luncheons. Two (2) company representatives at the show will have their badges identified with a Sponsor ribbon. Ten (10) drink tickets for the Securetech Afternoon Reception. Opportunity to provide two (2) pop-up banners to be displayed in the reception area for the duration of the networking event. Banners provided by sponsor and subject to pre-approval by CADSI. Maximum dimensions 6 in height and 3 in width. Opportunity to provide napkins with logo and text (napkins supplied by Sponsor and subject to approval by CADSI). Opportunity to distribute a promotional item to afternoon reception attendees (supplied and distributed by sponsor and subject to approval by CADSI). 15 DELEGATE SERVICES SPONSORSHIPS REGISTRATION SPONSOR $5,750 EXCLUSIVE Logo on materials promoting Securetech registration, including blitzes and promotions. Logo on the registration page of the Securetech website. Recognition as Registration Sponsor. Prime location of company name/logo on registration kiosks for Securetech. Complimentary extended company profile listing in the official event mobile app (150 extra words). Logo displayed on the Securetech schedule of events online. All Securetech Registration Staff will adorn event apparel that will have your logo on them further highlighting your sponsorship (apparel provided by sponsor with prior design approval by CADSI). Logo on floor plan. Two (2) complimentary conference track registrations. Two (2) luncheon tickets each to each of the TWO Securetech Luncheons. Two (2) company representatives at the show may have their badges identified with a Sponsor ribbon. Opportunity to provide two (2) pop-up banners to be displayed in the registration area. Banner provided by sponsor and subject to pre-approval by CADSI. Maximum dimensions 6 in height and 3 in width. Two (2) drink tickets for the Securetech Afternoon Reception. Opportunity to distribute a promotional item to conference attendees in the registration area (supplied and distributed by sponsor and subject to approval by CADSI). 16 SHOW BADGE SPONSOR $3,500 EXCLUSIVE All attendees must wear a Show Badge at all times. Capitalize on this premier opportunity for visibility as your corporate logo is featured on all of the Securetech participants badges. Recognition as Show Badge Sponsor. Logo on the official show Badge (black and white) worn by all attendees, exhibitors and staff. Badges and printing are supplied by CADSI and included in the cost of sponsorship. Opportunity to brief event staff on company information and how to locate your booth (maximum 5 minutes). One (1) company representatives at the show may have their badges identified with a Sponsor ribbon. Complimentary extended company profile listing in the official event mobile app (100 extra words). * Must be a non-competing organization to Lanyard Sponsor. 17 LANYARD SPONSOR $3,500 EXCLUSIVE Achieve high-level visibility as attendees, exhibitors and staff wear your corporate logo throughout the days of the Event. Recognition as Lanyard Sponsor. Logo on the official show lanyard worn by attendees, exhibitors and staff. Lanyards and printing of your company branding are supplied by CADSI and NOT included in the cost of sponsorship, Invoicing of lanyard order will be provided. One (1) company representative at the show will have their badge identified with a Sponsor. Complimentary extended company profile listing in the official event mobile app (100 extra words). * Must be a non-competing organization to Badge Sponsor. 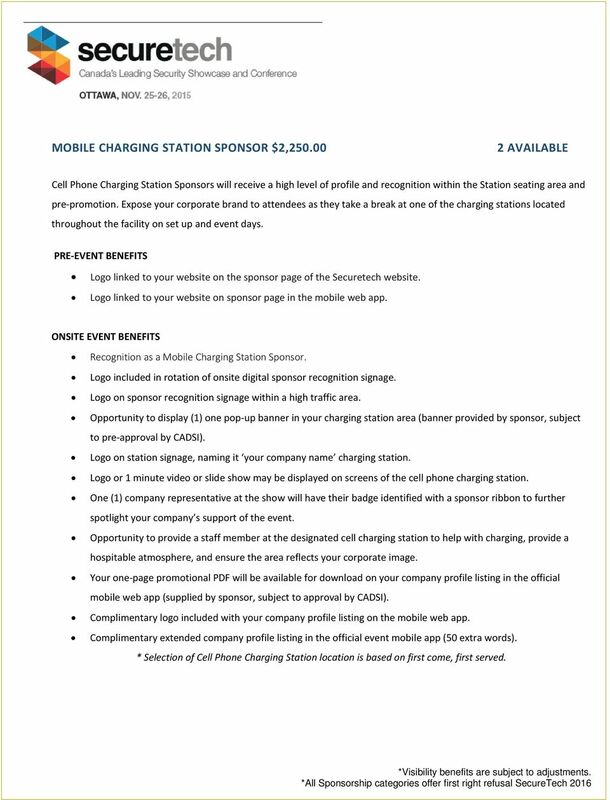 18 MOBILE CHARGING STATION SPONSOR $2, AVAILABLE Cell Phone Charging Station Sponsors will receive a high level of profile and recognition within the Station seating area and pre-promotion. Expose your corporate brand to attendees as they take a break at one of the charging stations located throughout the facility on set up and event days. Recognition as a Mobile Charging Station Sponsor. Opportunity to display (1) one pop-up banner in your charging station area (banner provided by sponsor, subject to pre-approval by CADSI). Logo on station signage, naming it your company name charging station. Logo or 1 minute video or slide show may be displayed on screens of the cell phone charging station. 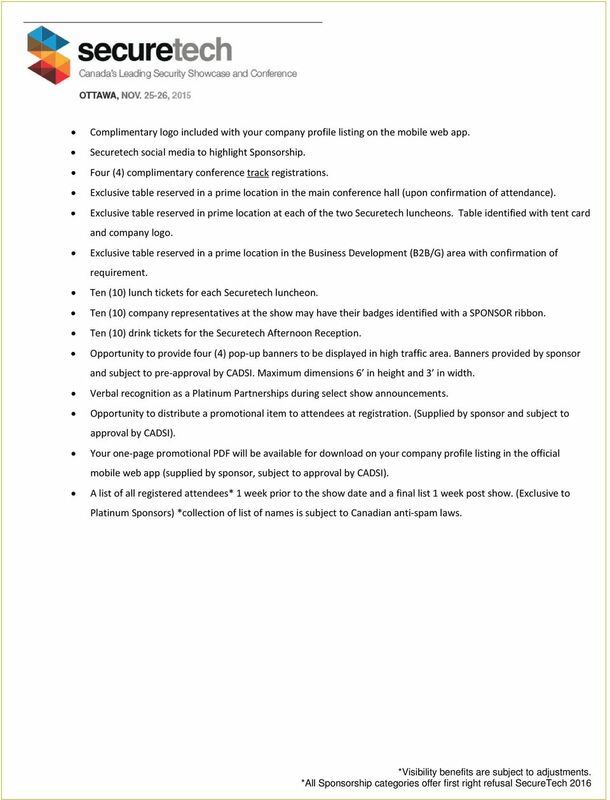 One (1) company representative at the show will have their badge identified with a sponsor ribbon to further spotlight your company s support of the event. Opportunity to provide a staff member at the designated cell charging station to help with charging, provide a hospitable atmosphere, and ensure the area reflects your corporate image. Complimentary extended company profile listing in the official event mobile app (50 extra words). * Selection of Cell Phone Charging Station location is based on first come, first served. 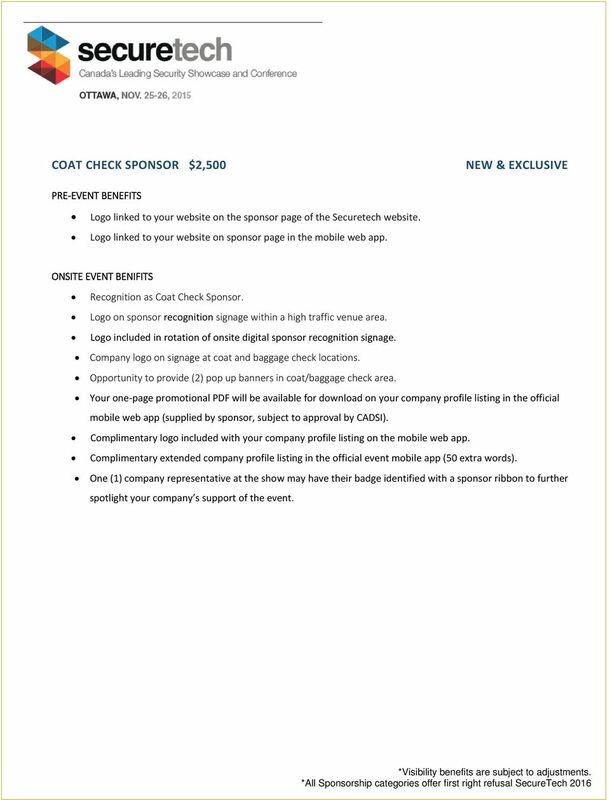 19 COAT CHECK SPONSOR $2,500 NEW & EXCLUSIVE ONSITE EVENT BENIFITS Recognition as Coat Check Sponsor. Logo on sponsor recognition signage within a high traffic venue area. Company logo on signage at coat and baggage check locations. Opportunity to provide (2) pop up banners in coat/baggage check area. Complimentary extended company profile listing in the official event mobile app (50 extra words). One (1) company representative at the show may have their badge identified with a sponsor ribbon to further spotlight your company s support of the event. 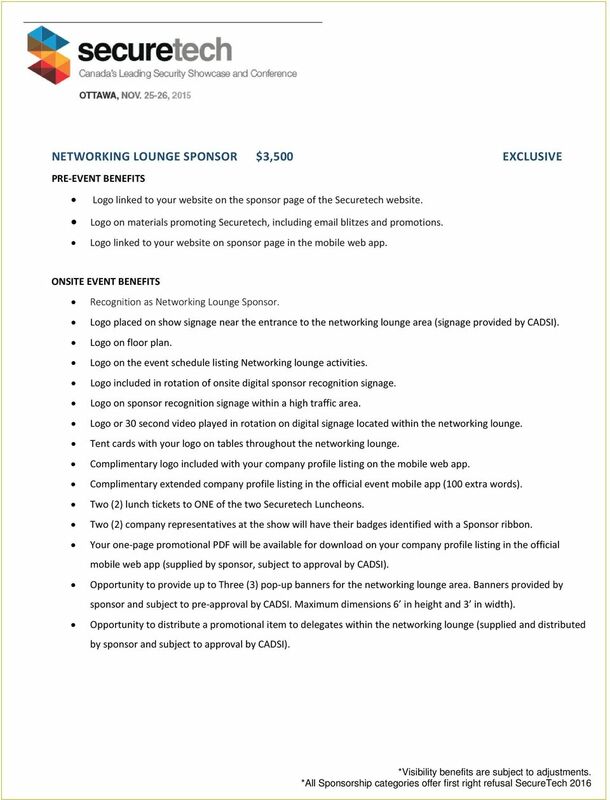 20 AISLE SPONSOR $2,000/PER This is an excellent opportunity to make multiple impressions on every delegate as they navigate the trade show. Recognition as an Aisle Sponsor. Logo on sponsor recognition signage within a high traffic venue area. Logo included in rotation of onsite digital sponsor recognition signage Logo and exhibit number prominently displayed on a double sided aisle sign hanging in the designated aisle above the exhibition show floor. Complimentary extended company profile listing in the official event mobile app (50 extra words). 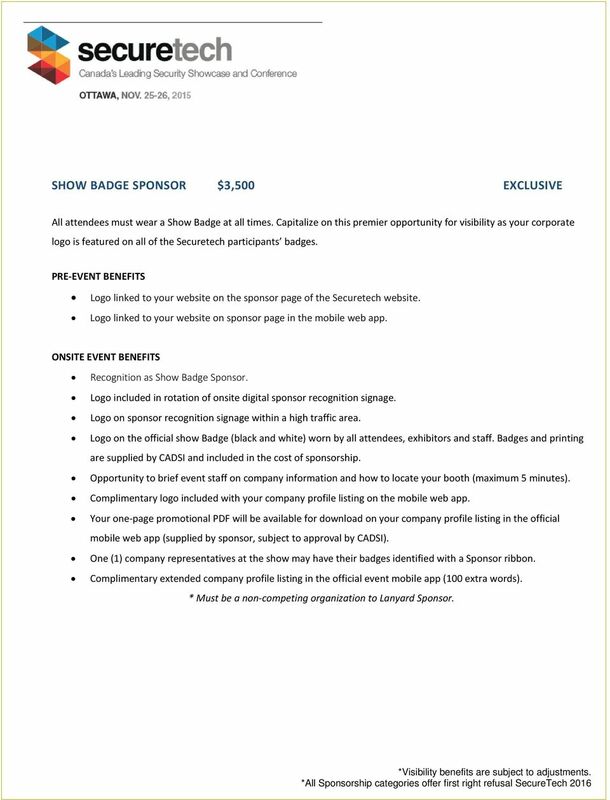 One (1) company representative at the show may have their badge identified with a sponsor ribbon to further spotlight your company s support of the event. Highlight your support of CADSI and the defence and security sector. Discuss and learn of future procurement requirements. Conference 2014. Sponsorship Opportunities. Be a key player in driving the evolution of pharmacy practice.